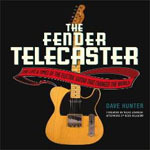 In a sort of sister book to his wonder book on Stratocasters, Dave Hunter traces the history of the iconic Fender Telecaster. The guitar is charted from its first prototype of the Fender Esquire in 1949 and how it turned into the Broadcaster and eventually the Telecaster. Hunter has done a terrific job in documenting Leo Fender's journey in developing the instrument. He talks about the inventor's early days growing up in Orange County, CA, and pursuing the piano and saxophone. How he talked to his musician friends, learned what they needed in a guitar and then built it. There are profiles of key Telecaster players including Albert Lee, Andy Summers, Jimmy Page, Keith Richards and Vince Gill. The problem here--the same confusion that existed with The Fender Stratocaster--lies in the layout of the book. Hunter will be describing some function of the neck, and the pictures show body shots. It is incredibly confusing and impacts on the through-read of the book. There are a ton of great photos here, but there is so much more that could have been included. Still, this is a terrific book on an amazing guitar. Even if you do look at the pictures.